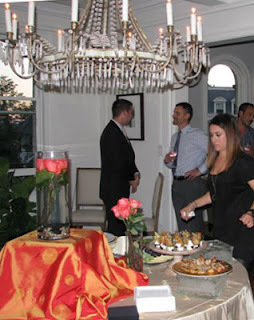 The beautiful Wendell Mansions apartment house at 2339 Mass Ave drew about 70 guests to a reception honoring the work of Restore Mass Ave on October 16. Mark J. Scott was the host; we all admired his recent renovation of one of the most amazing Beaux Arts interiors in Washington. Did we mention that Mark's row of large windows give wide-angle views of Mass Ave - including the trees? The sunset was almost as beautiful as Mark's table, which was loaded with goodies as fine wine was poured. President Deborah Shapley spoke, noting that RMA has arranged for 245 new trees in the past 6 years, from Dupont Circle west to 34th Street. She said RMA has a very active volunteer Treekeeper program most weekends in spring and summer. 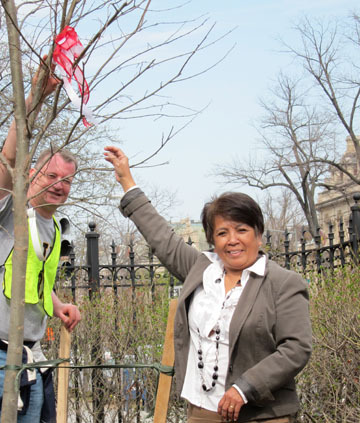 We plan to make Embassy Row a 'living classroom' by having more volunteers from other neighborhoods participating here - to how to help trees on their streets. By our volunteer program, model help for city trees, and social media outreach - like this blog - Restore Mass Ave shares its know-how broadly. 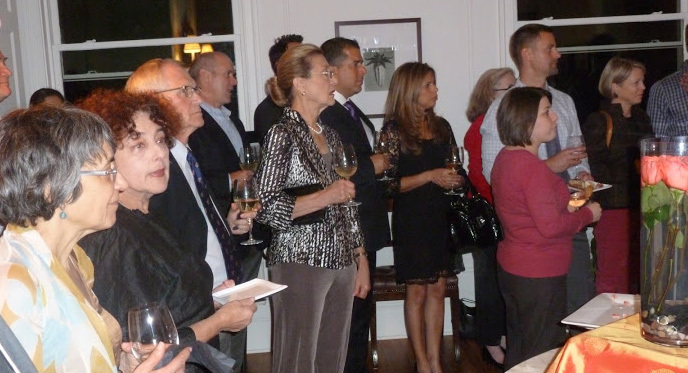 The party included guests from neighboring embassies, including the embassies of Haiti and Ireland. Thanks to generous underwriting by the Alex and Paul Group TTR Sotheby's International Realty, donations from guests and from those who could not attend - go 100% to our cause. What’s that group of people wearing florescent yellow jackets hunched over under a tree during rush hour doing? We work in two-hour sessions, sometimes on weekend mornings, or on weekday evenings, whenever we can. 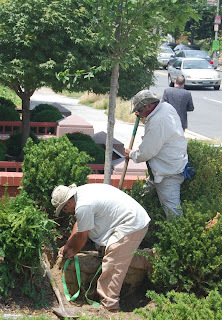 We’re re-greening Massachusetts Avenue. We want to re-establish a tree canopy by planting two rows of shade trees on each side of the avenue and making sure they are cared for so they survive and grow tall and big and beautiful. Our assignment is simple: Weed, loosen-up compacted dirt around the base of the tree to allow water and air to penetrate deeper into the ground, remove mulch volcanoes, sometimes water, clean-up, and call it a day. And we chat as we go about our work. Sarah, Chris, Gary and the famous RMA red wagon. What do we talk about? Trees. What kind of tree­­—Oak, Linden, Elm. Yes, there are varieties of elm that are resistant to Dutch elm disease. Different tree species are planted to avoid the problems of monoculture. We’re learning tree names as we go. OK, we start weeding. A lot of crab grass. Dandelion, too. We create a weed-free box around the tree. Then there’s the mulch volcano that someone who thought they were helping the tree piled up around its base. We rake that away only to find dirt piled around the base. So we dig the dirt (which we call soil) to get to the flare—the point where the roots start to spread away from the trunk. As we dig, we discuss the properties of soil: is it too clayey, too sandy, does it have enough organic matter, how do we improve it. And why are the tree roots so close to the surface. Some trees are planted way too low. More digging and the opportunity to try the various tools­—spade, digging fork, garden rake, pick axe, mini pick axe, trowel. Everyone has a favorite. Time to water or place a 25 gal watering bag around the tree.Why 25 gal—because that’s what a young newly planted tree needs per week for the first few years to get established in the ground. Working in the evenings, 6-8 PM, we witness the bumper-to-bumper traffic on Mass Ave—cars and buses and their fumes.Pedestrians and people at bus stops breathing those fumes.If only there were a few more trees to clean the air.And a little more shade. I show how far we had to dig to expose the flare of this black gum tree. On weekends it’s a different crowd.Many joggers. Bikers. Tourists and locals promenading and enjoying this historic site, some strolling to or from the farmer’s market.The air may be cleaner but a little more shade, a little more green would make it so much more pleasant. We cared for around 50 trees so far this season. We dragged our sturdy little red cart piled with tools up and down the avenue. 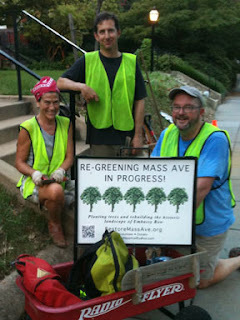 We proudly placed our Restore Mass Ave sign on the sidewalk and attacked the weeds. We got to know the trees. 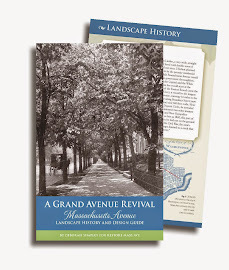 We're always looking for new participants in our program of saving the trees and landscape of Massachusetts Avenue -- the last "Grand Avenue" landscape in the nation. 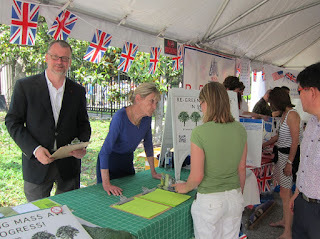 So we were delighted to tell our story -- how Restore Mass Ave gets trees planted, arranges care for them, our international allies and volunteers -- at an exhibit table at the British Embassy on May 12. The Embassy threw its gates open as part of the popular European Union Open House Day. 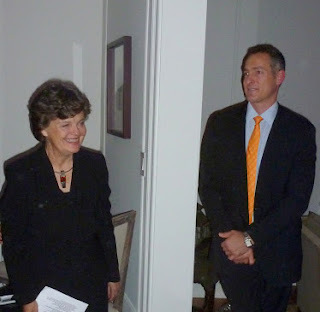 Robert Tarasovich and Claire Wagner of RMA greet visitors at British Embassy. Hundreds of people stopped by the table and got our flyer [pdf link below]. Several dozen signed up for follow-on news and to volunteer. Many of those interested were from other nations; also people signed up from other DC neighborhoods such as Georgetown and Petworth. Our "green community" grew! Making friends at embassies is especially fun. A sign of the Embassy event's huge popularity is that, today, by official count, 10,400 people visited the British Embassy. Though free shuttles buses carried the public among embassies, most people walked. The sidewalks were packed, with lines forming on sidewalks under our trees. Robert Tarasovich, RMA Board member leading this outreach, says: "RMA enjoyed the privilege"of being on the "beautiful and popular venue. We are grateful to Ambassador Sir Peter Westmacott and his staff, particularly Kelly Hysan and James Harris, for their hospitality and support." Entering the Embassy gates about 2 pm May 12. Visitors also learned the extent to which the British Embassy has "greened" its 1927 mansion and other facilities, significantly lowering the environmental impact of physical and human activities there. Restore Mass Ave was honored when the Embassy hosted our spring benefit in April 2011 [See RestoreMassAve.org/events.shmtl]. That thousands of people are fascinated by embassies was shown Saturday May 5, Passport DC's fifth annual Open House when 40 non-European Union embassies opened their doors to the public. We were thrilled to see crowds cluster under our recently planted, growing trees! The Chad Embassy (2401 Mass) in 2009 planted ten new trees advised by us and Leo A. Daly, the renovating architect. 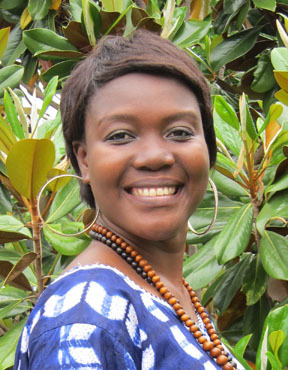 Chads Open House featured music and dancing with film producer Danielli Mbangdadji. She's pictured below, in front a magnolia grandiflora tree, which like the others is doing beautifully thanks to the Embassy's care. Below, the Brazil Embassy residence known as the McCormick Villa (3000 Mass) saw streams of visitors. In the garden, they clapped and swayed to Capoeira dancing performed by Abada-Capoeira, a local troupe. Men, women and even children dance in pairs, tumbling and kicking (sort of), and competing to pick up a small object in their mouths! 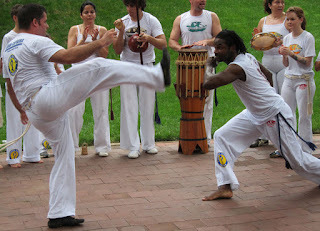 More photos of this performance are at Abada-Capoeira. Link to Restore Mass Ave pdf of flyer and of historical card goeshere. Our city's trees got a mixed report card this week from Casey Trees. The overall grade? Incomplete. We got an A+ in Tree Planting, but "incomplete" in Tree Protection, according to this fourth yearly exercise by Casey Trees. The report's main news concerned Tree Coverage. Thirty five per cent of Washington's land area was found to have tree canopy (area of tree leaf crowns seen from above) in a 2006 analysis by the respected University of Vermont Spatial Analysis Lab. This finding formed the basis of the goal set by DC Mayor Adrian Fenty to expand canopied area to 40 per cent by 2035, announced in 2010. Meeting the goal is important to city compliance with the Clean Air Act Amendments and the Clean Water Act. "The 2011 assessment reveals that this percentage is virtually unchanged," said the report card, which gave a grade of B+, same as for two prior years. In other words, Casey Trees is not buying - yet - a reanalysis of DC tree data issued by the Urban Forestry Administration a few weeks back. UFA reported that city land had 37.2 per cent tree canopy, The Casey Trees report says: "If UFA-DDOT [Department of Transportation] releases the data from this publicly funded project, we will compare both sets and issue a findings report." The report card credits the expansion of grass and treed areas in 2011, funded by the American Reinvestment and Recovery Act (ARRA) and carried out by UFA and the Department of the Environment (DOE). For example, UFA added three acres of plantable space by enlarging and opening sidewalk tree boxes and planting median strips with trees. An example is on Bladensburg Road northeast, which is illustrated in the report and below. 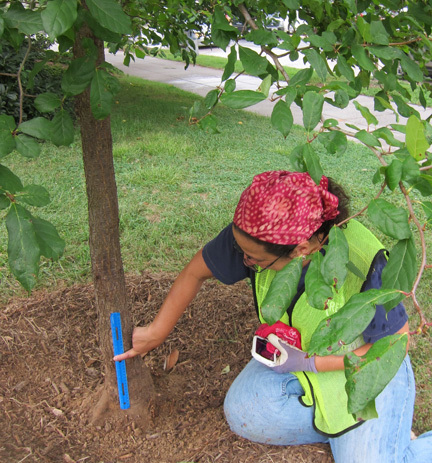 Tree Health Casey Trees will next assess DC trees in 2013 when it returns to 200 randomly chosen parcels whose trees it assessed in 2004 and 2009. It has no basis for changing its 2009 finding that 82.5 per cent of city trees are "good to excellent" health, for a grade of B-, the same as for 2010 and 2009. But, the report warns, Dutch Elm Disease (DED) still threatens non-disease resistant American elms. A new threat is the Emerald Ash Borer (EAB) which has killed tens of millions of ash trees in 14 states and threatens billions more ash trees. EAB was found in a Prince George's County nursery, triggering a quarantine on the movement of possibly infected wood. Though just 2 per cent of DC trees are ashes, the largest ashe trees in DC are on private land, so residents could suffer if EAB is allowed to spread. See more on the EAB quarantine. Pending the outcome, the Casey Trees report gave an "incomplete" for Tree Protection. Tree Awareness, a past category, was omitted this year due to the "difficulty of gathering sound data" to support a specific grade. This is the category where local activists such as Restore Mass Ave help to raise the city-wide score! Apparently this metric may be resumed in future. Casey Trees' general warning, in this report and voiced elsewhere by Mark Buscaino, Executive Director, is the danger to DC's tree canopy from population growth. more people comes more development pressures that threaten established tree canopy and open space," says the report. If the city's tree canopy is now essentially the same as in 2006, and if canopy is lost due to development, "the hill [the city] must climb to reach the goal becomes much more difficult." Tags: tree canopy, Casey Trees, Department of the Environment, Urban Forestry Administration, University of Vermont Spatial Analysis Lab, Mark Buscaino, Adrian Fenty, Clean Air Act Amendments, Clean Water Act, American Reinvestment and Recovery Act, population growth.